In its design of the Citizenship and Immigration Services facility in Irving, Texas, 4240 Architecture aimed for a space that would fit with the solemn oath new citizens make in its main hall, while also conveying a welcoming atmosphere. The new 56,000 square-foot building - whose focal point is a two-story glass-enclosed Ceremony Room shaded with roller shades by Hunter Douglas - delivers on that promise. The facility has a sense of grandeur without being imposing and stands as a beacon visible from nearby Highway 114. The process of becoming a citizen can be "daunting," says Robert Benson, design director for 4240 Architecture's offices in Chicago. Working with developer JDL Castle Corporation of Winston-Salem, North Carolina, the CIS facility seeks to "celebrate" citizenship while making the experience of attaining it comfortable. The CIS building, which includes candidate interview rooms and administrative offices for 140 employees, replaced two separate office buildings. They were dark, "kind of grungy run-down buildings" with few windows, says Tom Hanley, project manager for 4240 Architecture. 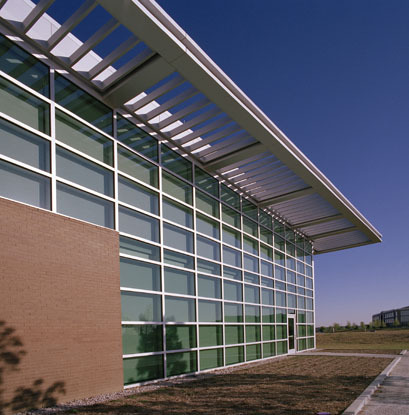 With its natural light and open feeling, the new two-story glass and brick building feels "less institutionalized" and much more "inviting," says Kristy Sheive, CIS immigration services analyst. The physical approach to the building stands as a metaphor for the experience of coming to America for many immigrants: They might perceive life in America one way but then experience something different as they begin to live in their new home. 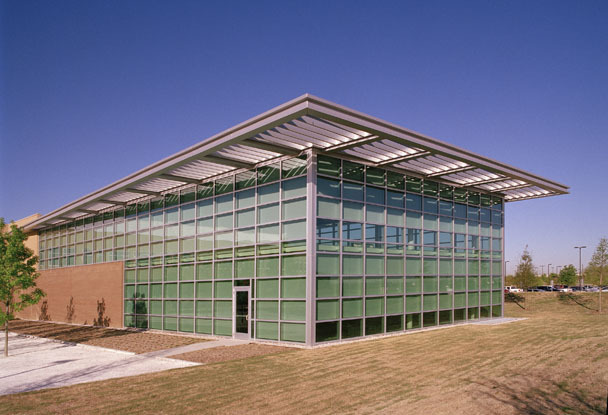 In the same way, from the highway the CIS facility appears as a simple two-story box, but as visitors approach, they quickly realize that the first and second floor walls are not aligned, helping to "break [the structure] down into a smaller scale," says Benson. CIS also wanted to project "transparency" to reflect a sense of openness and the agency's friendly approach to helping people become citizens. Another challenge was designing a space with so many glass walls, while meeting blast-resistant requirements of a government building. Key to the team of JDL Castle Corporation and 4240 Architecture winning a competition for the contract awarded by the U.S. General Services Administration leasing program, was its design of the Ceremony Room. With the hot Texas sun entering through 40-foot glass elevations, "controlling the light," was crucial, says Benson. 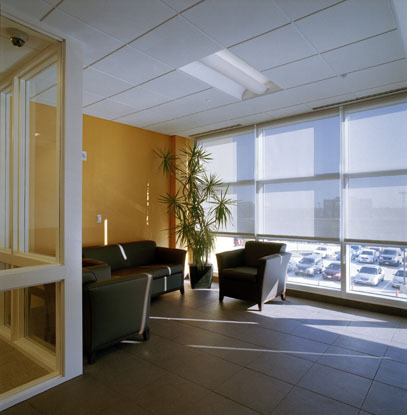 To reduce glare and solar heat the team specified Hunter Douglas motorized roller shades with GlacierScreen™ fabric on the North, West, and East elevations which allow light in while minimizing glare. At the grand opening ceremony on Feb. 25, when 18 individuals became naturalized citizens in the Ceremony Room, "there was a beautiful, warm glow inside the space," according to Benson. The light, he says, is "soft but full and very comfortable." 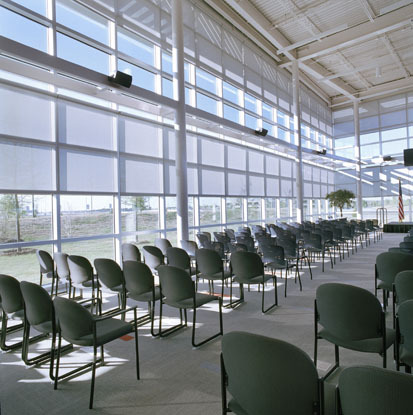 Made with a PVC-covered high-tensile polyester fabric that is VOC-free, GlacierScreen™ provides the best qualities of PVC - it's strong, resistant to stretching, durable, and easy to keep clean - and yet there is no "off-gassing," no volatile organic compounds. "It's the best of both worlds," says Hunter Douglas Contract Regional Sales Manager Christopher Hagen. GlacierScreen™ has an OEKO TX-100 Certification from the textile industry that ensures nothing harmful to human beings was used in the construction of this material. Another reason the architects chose the GlacierScreen™ fabric was its availability in wide widths, says Colin Cope, principal owner of the Dallas-based Ross Howard Designs. This made larger scale shades possible without seams. 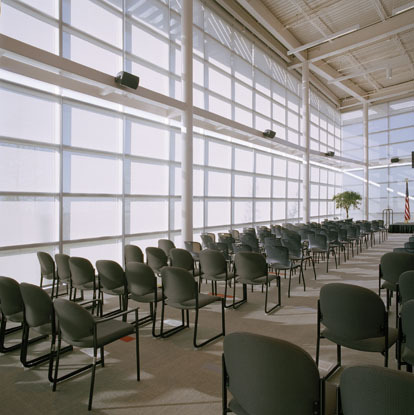 In addition, Cope says GlacierScreen™ "fit nicely within their budget." 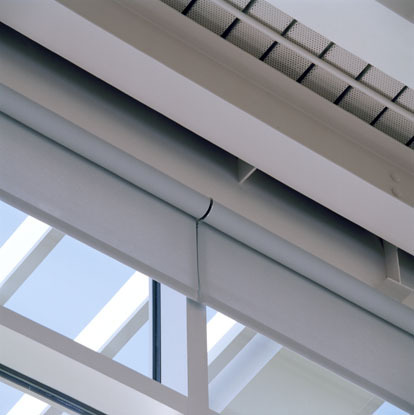 An installation challenge in the Ceremony Room was finding a convenient location for controls operating the Roller Shades. With glass walls, says Hagen, there was no place to hide the power sources. Instead of building and installing a separate control box for each shade, Hunter Douglas created one customized control box and mounted it in the security room inside the main hall. Loren Cope, project manager for Ross Howard Designs, managed the on-site installation of the Hunter Douglas products. To benefit the customers and employees, the designers went to great lengths to bring light into the offices, using light shelves and interior glass walls, allowing natural light to travel throughout the spaces. Light is psychologically important for people, notes Hanley. It improves morale and "keeps people alert and doing their jobs." 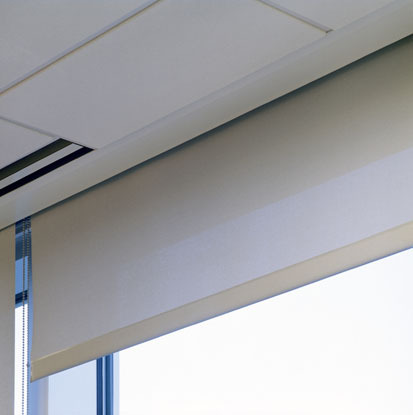 Hunter Douglas manual aluminum horizontal blinds in first floor offices are made of 95 % recycled material. 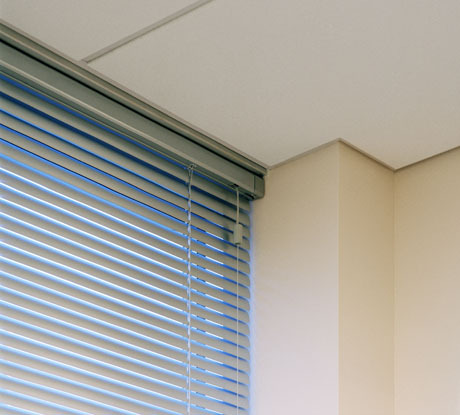 The spring-tempered slats keep their shape, thanks to bounce-back quality, "adding a high level of flexibility and rigidity to the blinds," says Hagen. 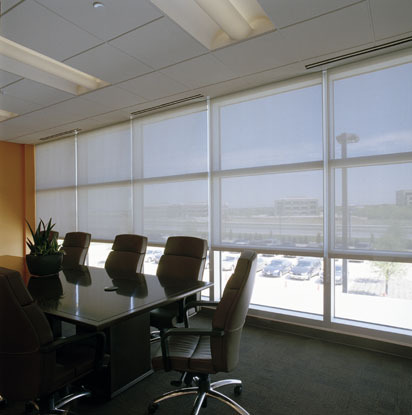 Workers in the second-floor offices control the amount of light in their work spaces using Hunter Douglas manual Roller Shades that are recessed into a 5 1/4" ceiling pocket. 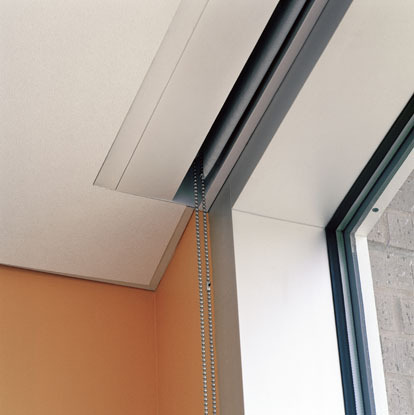 The fully recessed shades are hidden from view and integrate completely with the drop-down ceiling. Although the project was complicated, everything went smoothly, says Colin Cope. "The support and technical assistance from Hunter Douglas was invaluable for ensuring the success of this project." The CIS facility is positioned atop a hill in an office park and surrounded by indigenous plants and rolling berms. 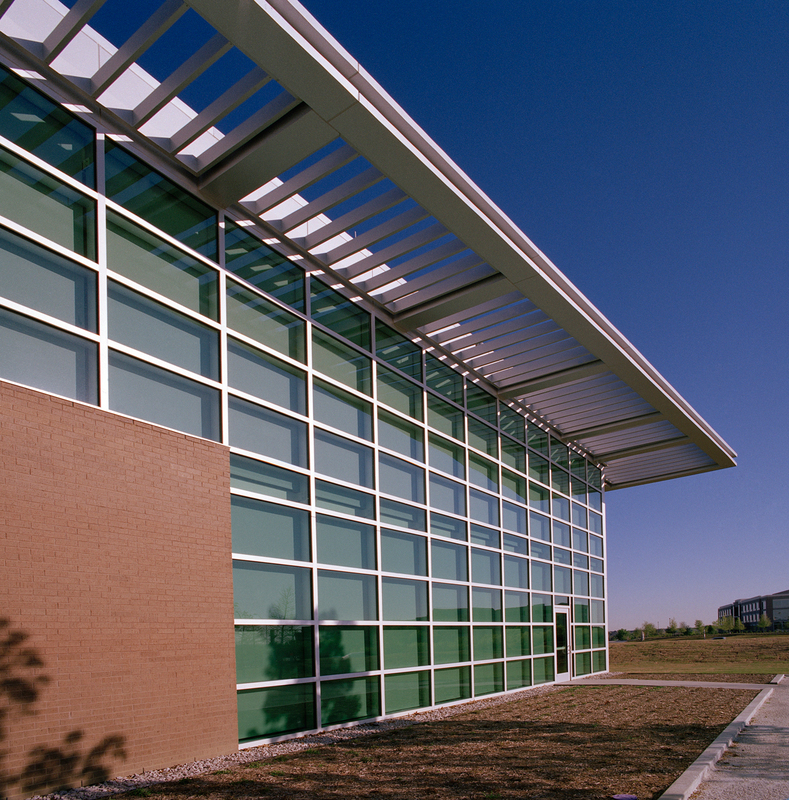 The building's colors, size, and "subtle" site design blend in with the Texas environment, says Benson. From the warm, comfortable light throughout the building to subtle details such as the building's inflection at the entryways drawing visitors inside, the new CIS facility has transformed the experience for the newly minted citizens whom it serves. The building's environment, says Sheive, makes people feel less "apprehensive as they wait for their interviews." It "helps them relax."